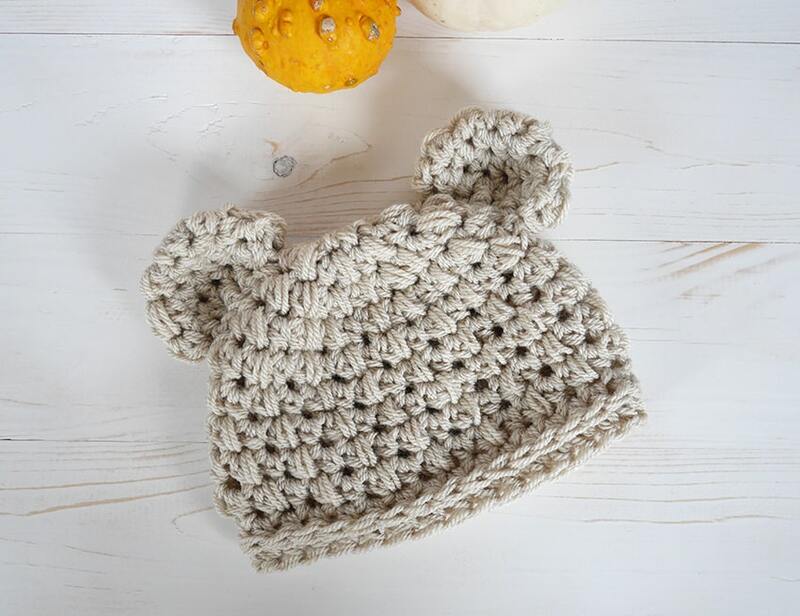 I usually love those chunky hats for babies. You know, the ones with big poms poms on? They are lovely! This hat is going to be chunky, but I didn’t use bulky yarn. The idea began because I had a lot of leftover DK and worsted yarn from blankets I made for all my girlfriends when they had their babies. Baby blankets are another addiction of mine, but we will talk about it another time. A really close friend of mine gave birth recently to her baby boy. Instead of just making her a blanket I decided to add a hat and some baby booties to the package. I made her the Benson baby blanket, so I had leftover yarn in 3 colors and thought that all these together would make a great matching set! It’s October after all, she was going to need them! 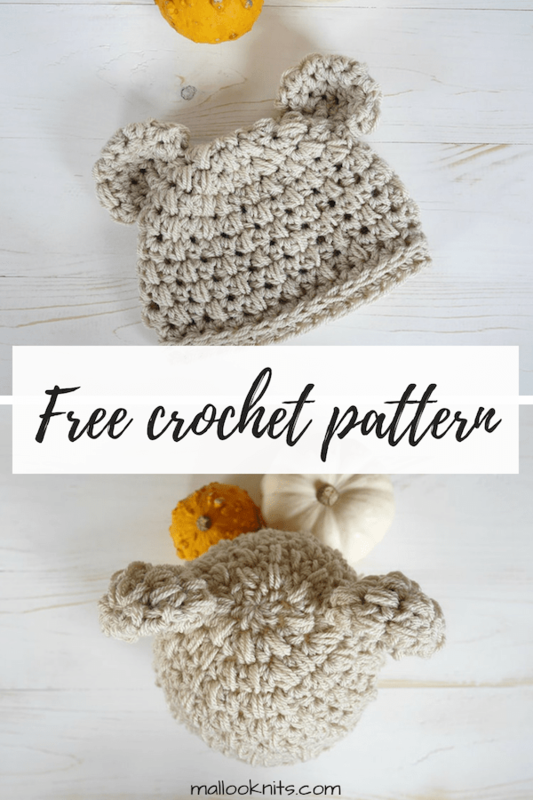 I had almost one skein left from this neutral color and thought “Why not double the yarn and use the most of it?” It would make a great chunky newborn hat but without the bulky yarn. Great stash buster! Did you know you can hold your yarn double even if you only have one skein? Just use one end and dive in the middle of the skein to find the other. It might be a little tricky if you haven’t done it before, but practice makes perfect. Just be careful when you ‘re crocheting and pulling the yarn. Remember to also rotate the skein by lifting it up. It will rotate in its natural place to unravel. 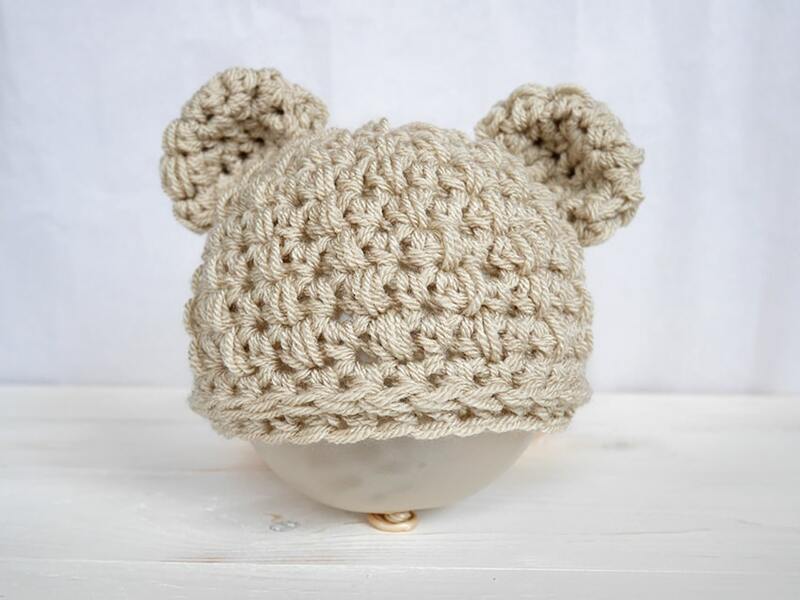 Adding the bear ears to the hat was an easy decision. After all, who’s entitled to wear animal ears on their head and look abnormally cute, if not a baby? Also, adding texture to almost anything is another thing I love to do. Most of you may learn a new interesting stitch today. Don’t be intimidated! Just follow the instructions, it’s pretty easy. Don’t you think it’s time to dive into the pattern? Let’s do it! 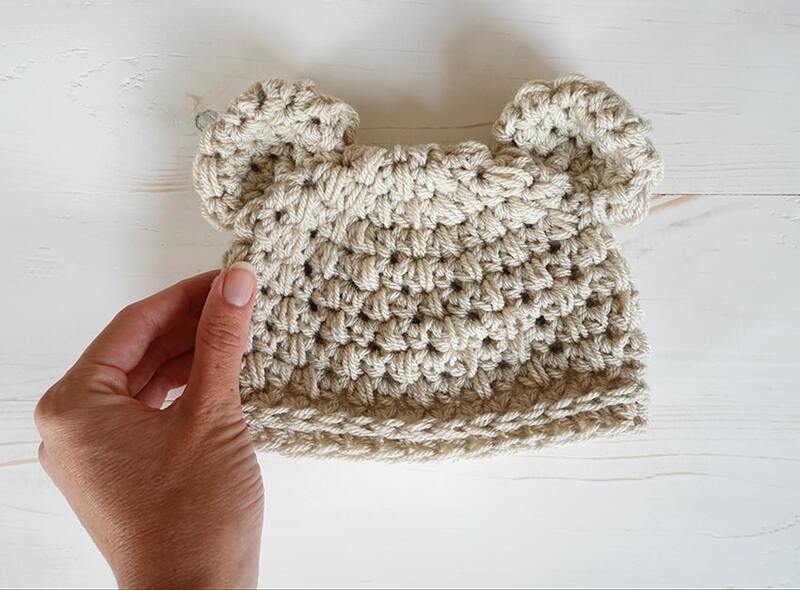 You will hold the yarn double for the whole project, newborn hat + ears. 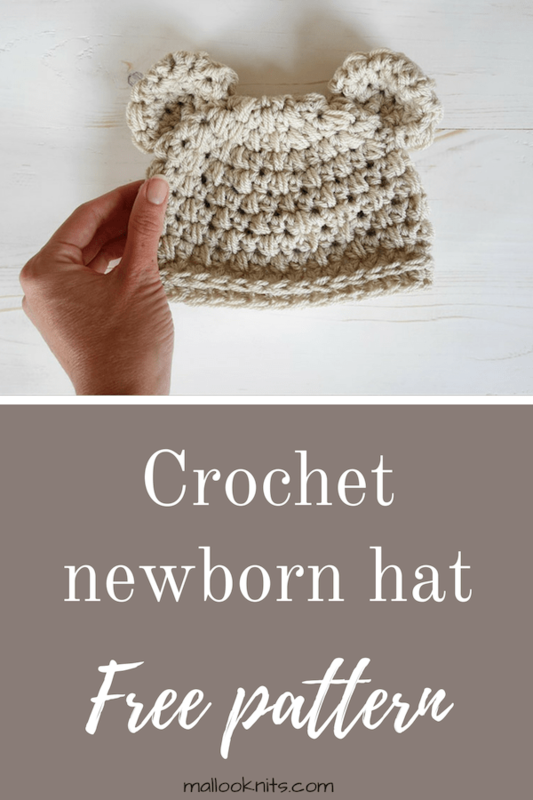 This crochet newborn hat fits head 14-15 inches (36-40 cm). Fhdcinc: This will look like an increase but it’s not. It is designed to increase only the bulkiness of the stitch. You will complete all the steps of this stitch in the same stitch. Yarn over, insert the hook in the indicated stitch, yarn over and pull through, yarn over, insert hook in the same stitch, yarn and pull through, yarn over and pull through all loops on your hook. When two or more stitches are in a bracket you will place all these stitches in the same stitch. R11: hdc in the third loop only (camel stitch) in each st around, sl st, fasten off. If you don’t know the camel stitch and how to locate the third loop of a hdc, I have a tutorial for you. 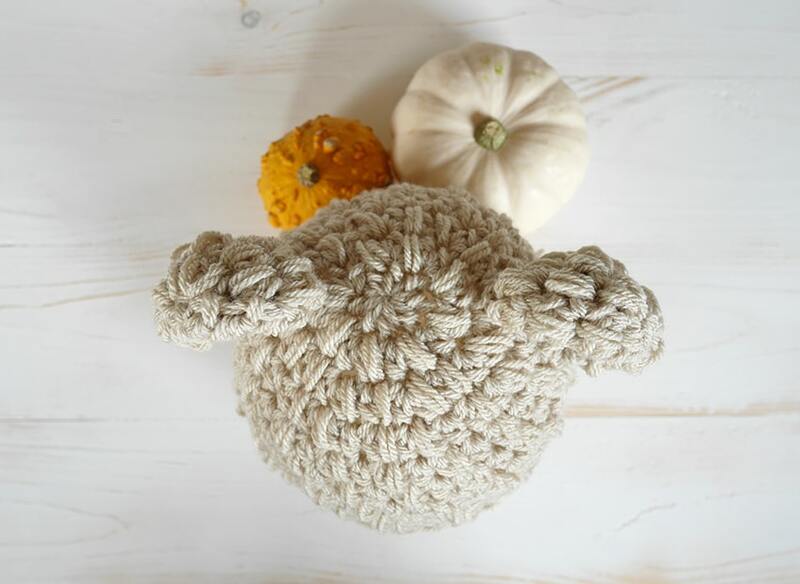 The back half of the ear will be textured with our special fhdcinc stitch and the front half of the ear will be plain with just hdc stitches. 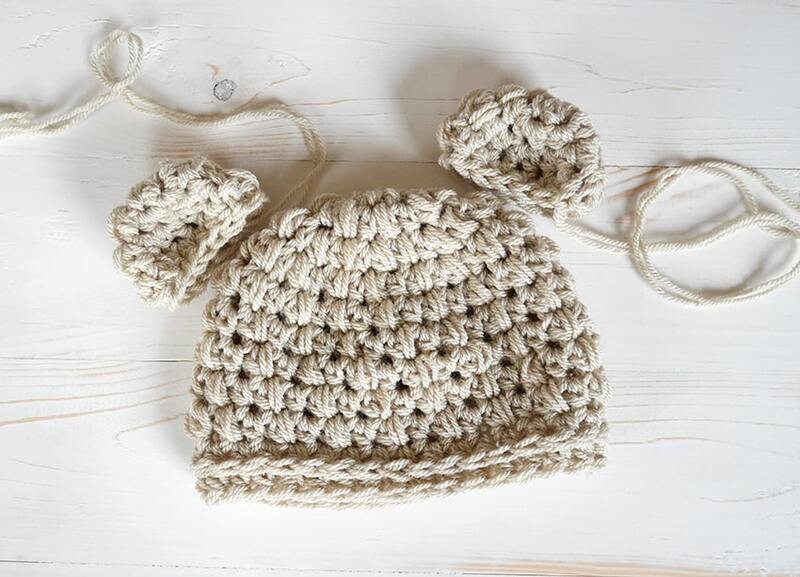 You will sew the ears between rounds 2 and 5 of the hat. Pro tip: Inflate a balloon inside the hat, hold it between your legs or tape it on the table. This will help you find the optimal place for the ears and sew them easily! That’s it! Wasn’t that easy? Besides being a great stash-buster, I bet you can make a bunch to donate for charity. There are a lot of hospitals that accept them to keep those newborn babies warm! 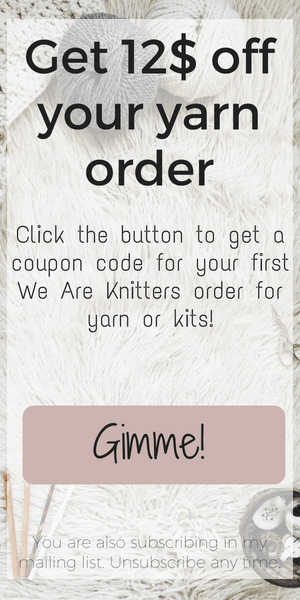 Are the instructions for the special stitch exactly what needs to be done within the parenthesis or does a hdc need to be added before your directions?